Cloud computing and all-flash storage are two of the most important innovations driving next-generation IT initiatives. While it may seem at first that these are parallel trends, in reality they are inextricably intertwined. 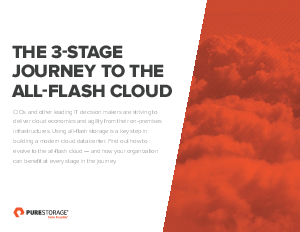 Without the benefits of all-flash storage —driving new levels of performance, agility and management simplicity — enterprises would not be able to modernize their infrastructures to deliver cloud services. It is no coincidence that the largest hyperscale cloud providers rely on all-flash storage solutions as their storage foundation. Pure Storage all-flash storage arrays provide enterprise customers with a safe, secure and smooth path to the all-flash cloud. You can take the journey in stages, starting small with a single application or two, and then adding more applications through consolidation and virtualization. You can also implement multiple stages at once.